Sell your Chometz Online. . . The Comrades Marathon is arguably the greatest ultra marathon in the world where athletes come from all over the globe to combine muscle and sinew and mental strength to conquer the approx 90 kilometres between the cities of Pietermaritzburg and Durban. 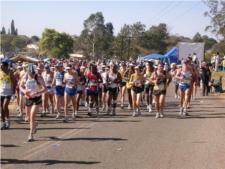 It is a cherished national treasure and attracts thousands of runners, spectators and television viewers every year. Many runners and supporters would like to show their gratitude to Chabad of the North Coast in Umhlanga for the years of dedication and support on and off the road towards the Jewish Comrades runners. It is our hope that at this milestone of 20 years involved with Comrades, that we will be producing at hard cover photo jounal of your Comrades experience with Chabad. We will be offering full and half page sponsorships as well as message dedications and also name listing to show your support to Chabad and furthering the outreach to touch so many more lives. If you have any photos please forward them to me at chabadnc@global.co.za We will shortly put the costs of the sponsorships, dedications and name list, which will all appear in the photo journal. The journal will be completed directly after this years marathon and photos will be added to complete this memorable milestone. The funds raised will be dedicated towards the building of a much required Mikvah Complex, which will include a women’s mikvah, a men's mikvah and a mikvah for utensils. (Keilim), at the Chabad House in Umhlanga. Please use your Name Surname and MIKVAH as refrerence or Name Surname and Journal. Thank you for your support. It’s greatly appreciated. Chabad Banking Details and Credit Card payments secure online here. We need your help please! !